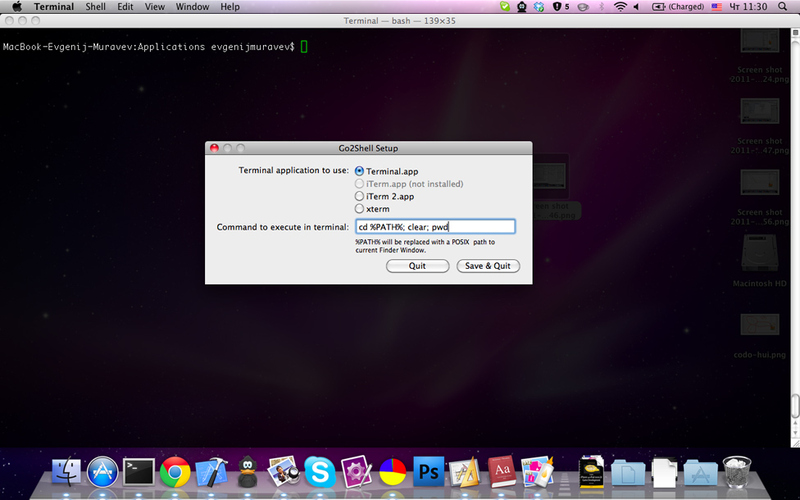 I would like to set iTerm2 instead of terminal.app as my default terminal. 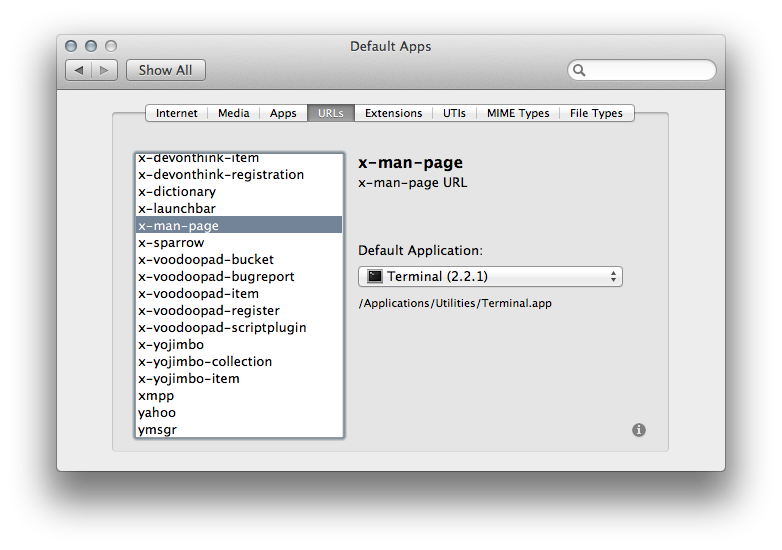 Go2Shell for example let you open a terminal to the current directory in Finder. I want to ba able to use iterm2 instad of terminal.app. I didn't find any answer on the official documentation. Terminal.app declares itself a handler of the ssh, telnet and x-man-page URL schemes. It also registers the file extensions .term (sessions), .terminal (settings), .tool and .command (scripts), and itself as an editor/viewer for these. Other than that, there is no default terminal in OS X. It's just an application that can handle URL schemes and file types. iTerm is capable of handling all of these except the Terminal.app specific .term/.terminal. For the file types, just open the Get Info dialog and associate all files of this kind with iTerm. For the URL schemes, you can download and install the preference pane Default Apps and change the association there. You can also use it as an alternative method of changing the file type associations. The association with Terminal.app is hard-coded. You need to create your own Services e.g. using Automator and/or AppleScript to replace these. If Terminal is used via its AppleScript API, there is no way to just replace it with iTerm in all cases, as their APIs are quite different. This will often require substantial changes to the programs or scripts doing that. 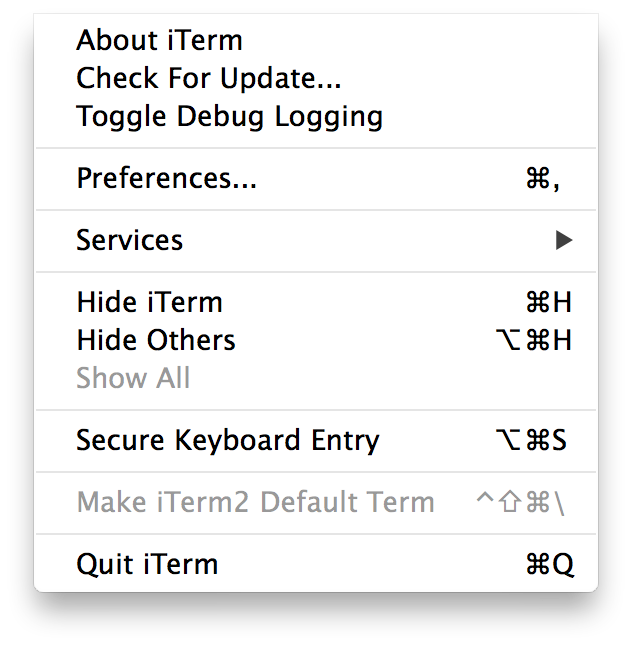 You should be able to make iTerm.app your default terminal by selecting "Make Default" from the menu bar. Alternatively you can use a keyboard shortcut. Fire up your favorite terminal program. macOS (OS X) does NOT support the concept of a default terminal. See Daniel Beck's helpful answer for background information. iTerm2 itself somewhat misleadingly offers a menu item named iTerm2 > Make iTerm2 Default Term (as presented in halfcube's answer), but the only thing that does is to make Finder run shell scripts opened from it in iTerm2 (more specifically, it assigns the shell role of UTI public.unix-executable to Finder) - which is not a typical use case. 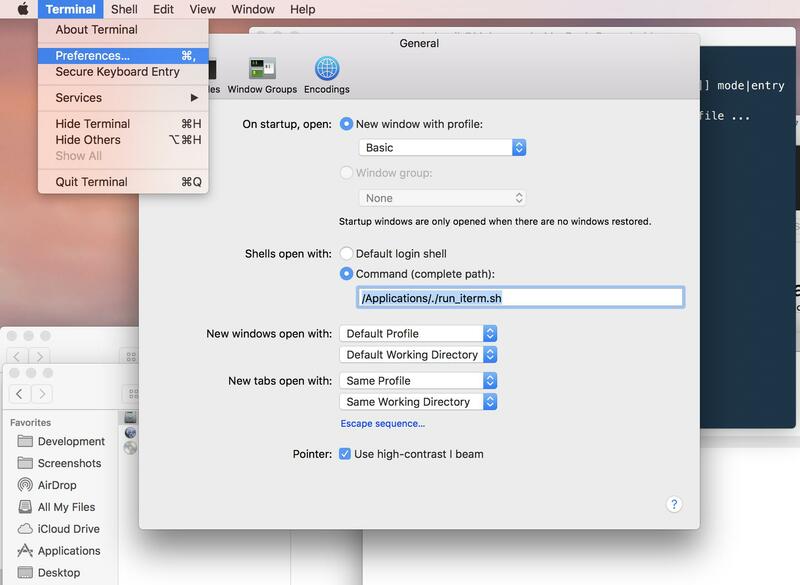 While the Go2Shell app that prompted the OP's question does have a configuration dialog that supports iTerm2 (open -a Go2Shell -- config, the application doesn't seem to work at all as of OSX 10.11.6 (on clicking the toolbar button as of v2.23, the only thing that ever happens is that the configuration dialog comes up, even after having clicked Install Go2Shell to Finder). 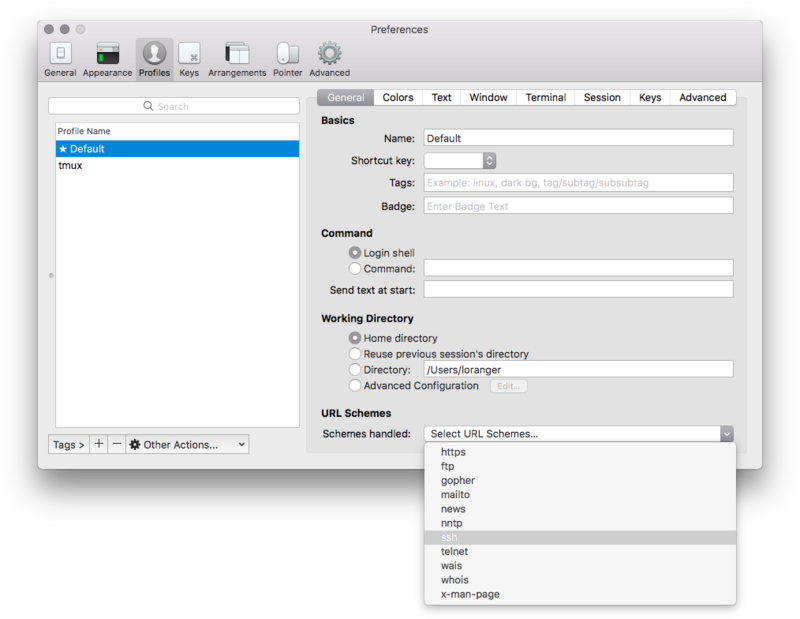 The paid alternative mentioned by the OP - application ShellTo - also supports iTerm2 in principle, but as of this writing doesn't support the current version, v3+. What @gef posted was partially what I did. However, this is what worked for me. And voila, the terminal app should open give a new parameter to iTerm, then close itself again. This thread was for OS X Lion, and seems out-of-date for El Capitan. However, since I found this page while searching for a way to have XCode launch iTerm instead of Terminal, I thought I'd post my solution. It's not free, unfortunately, but it can be done using the Magic Launch system preference app. Using that tool, I set iTerm as the default app for .term, .terminal, and .command extensions. That did the trick for my needs. Not the answer you're looking for? Browse other questions tagged osx-lion terminal.app iterm2 or ask your own question. Does “x-terminal-emulator” work on OS X? How do I set the title of Terminal.app with the fish shell? How do I launch a command file (e.g. *.sh) in a separate shell interaction utility (e.g. iTerm2) on my user's login? How can I launch a new Terminal in OSX with a specified profile from the command line?